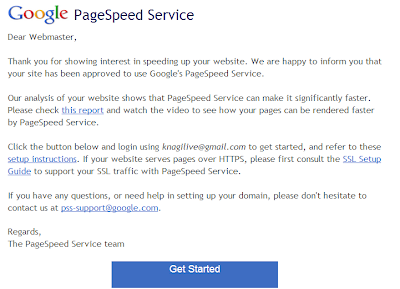 How to Use Google Page Speed Service? Google has always been the perfect partner and guide on the internet for you. They always stand out to provide you with easiest accessibility to things on the web, and they have done more to make internet more enjoyable for you and give a fruiful online experience. 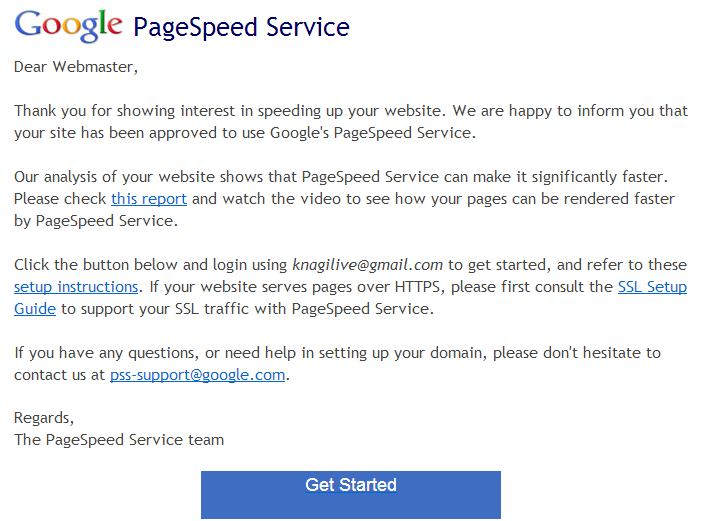 Google Page Speed Service is another innovative service release by the Google which is already revolving around the market. The importance of it can be realized by the fact that it is one of the important factors for a blog to have an extremely good SEO. First of all you will need to send in request for access by filling this web form. After submitting this form, you will receive an approval email from them. The figure below shows a screen shot of the approval email sent by them. Following your request approval, you will need to login to Google APIs Console with the same email ID. After logging in, click on the Page Speed Services visible on the left side, and go to Overview. Now you need to add the domain which you had requested during the process of approval. You will have to verify your domain ownership in case you have not. In case you have verified the ownership previously, following screen will be visible to you. They will either ask you to change A record or CNAME Record. Next you need to login to your domain provider and do the steps they ask you. You need to know that settings will be updated on the server according to the time of your domain provider. It might take an hour or might even go upto a day in propagating your settings. After your settings are propagated and ok on the servers, you will be able to see enabled message in Google API console. After you have completed a successful setup , Google will serve you data from the Page Speed Server and the visitors of your website will be glad with faster loading time. BloggingeHow | Making Blogging Simpler: How to Use Google Page Speed Service?